Hello Inspy Romance readers! I’m Liwen, and this is my first post on this amazing blog! Lindi Peterson invited me as a guest back in February of this year and I was so touched by how welcoming and supportive all of you were. I’m thrilled to join this community and look forward to getting to know each one of you better. I was an only child until the age of 10 when God answered my prayers for a sibling. My sister brought so much joy to our family as soon as she arrived and I’m so thankful for her. Due to our age difference, I did get mistaken for her mom a couple of times when we were younger! My family moved to another city when I was twelve. As you can imagine, changing schools in the middle of seventh grade was quite challenging for an introverted teen. I’ll admit I hated it and thought the move was the end of my life. ;) I’m so thankful God brought some good lifelong friends my way soon after. The first year I was at college, I went home every weekend due to homesickness. Once I got plugged into a great fellowship, however, I hardly went home. My college experience was, without a doubt, the best time of my life. My hubby and I met at church when we were 25 and 23 respectively. We found out later on that we had crossed paths about a decade earlier at a church retreat. A friend of ours showed us the group photo we took the final day of the retreat and there we were, standing five feet from each other! I’ve loved reading and writing for as long as I can remember. Becoming an author, however, was nowhere on my to-do list until my late thirties. I started out by publishing a children’s book that I had written in high school, then decided to write my own love story in fictional form. Some other jobs I’ve had included working as a Human Resources Rep at a biotech company, a receptionist at a crisis pregnancy center, and a therapist at a recovery home for teens. Nowadays, being an inspirational and sweet romance author is my second job; my first is being a chauffeur and referee (aka. a stay at home mom) to my two munchkins. I’m happy to say my son has inherited my love of reading, and my daughter, my love of writing. I’d love to share two projects I’ve been working on. 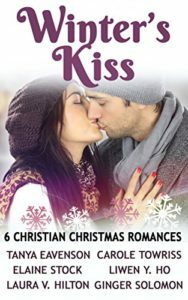 The first is Fall Into Romance, a boxed set of small-town romances that fellow Inspy Romance author Melanie Snitker is a part of, too. Please note, the ten novellas in this set are NOT Christian/inspirational, but they are sweet and clean. This set is available for only 99 cents (please click the image for the buy link). The second project is a Christian romance boxed set that will be releasing November 7th! Fellow Inspy Romance author Ginger Solomon is part of the set, too. You can pre-order your copy for only 99 cents! Please click the image for the buy link. My story from Winter’s Kiss is Tropical Kiss and Tell. It features characters from two other stories of mine, Lucy Choi from Drawn to You and Micah Chan from Tropical Kiss or Miss. 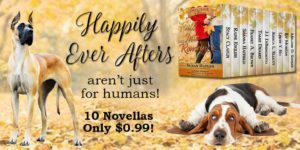 Lucy and Micah were just children in those books, but now they are all grown up and finding their own happily-ever-after. 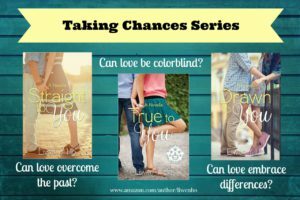 My Christian romance series, Taking Chances, is all about taking a chance on love. What have you taken a chance on in your life? Please comment below and let me know! Feel free to also include a fun fact about yourself. I can’t wait to read your answers! Giveaway: I’d like to give away one digital copy of a book from my Taking Chances series (winner’s choice). One winner will be randomly chosen from the comments below. The giveaway will remain open until midnight on Sunday, October 15th. Hi Liwen, how exciting to have you as a regular blogger:) I look forward to hearing more from you, as well as exploring more of your books. My husband and I took a chance by accepting the jobs we are in now. We had specifically said we did not want to move where we now live, God smiled and said- My plans, NOT YOURS- and 15 years later, we praise God that we took the chance to work where we are. It is a constant reminder to let go and let God lead. I enjoyed reading your seven facts. I also like to read your books! Hi! :) Thanks so much. It’s good to see you here! Welcome. IMO, being “Christian” does not mean directly referring to God, every other page. If it is clear from behavior (prayer being a part of every day life, trying to be Christian in actions, etc.) is as good. Not all “preachers” are on street corners, in churches, etc., they can also be found in those who openly try to *live* as Christians. Thanks for the welcome and sharing your thoughts, Walter. What a fun post to read! I guess the biggest thing that we are taking a chance on now is retirement, and having to trust God to meet our needs. My husband has been blessed to find some ways to supplement and provide for us. We have 6 children whom I homeschooled. Four boys, two girls. The last is halfway through college. Hi Becky! What a big accomplishment for you both. So glad to hear God is providing for you. Welcome to Inspy. Enjoyed your post and learning about you and your family…as well as your writing. I am an avid reader so will check out your books! Hi Jackie! It’s great to meet you. Thanks for checking out my books! And let’s see, a fun fact from me… My first release was an *extra* in a movie released last year. Hi Brenda! Ooh, that’s so cool! Do you mind mentioning which movie? Oh, neat. I’ll have to check it out! Welcome to InspyRomance! I’ve read several of your books so far, and have enjoyed them – one reason being that I grew up in the SF Bay area and recognize a lot of the settings. I too really enjoyed my college years (much more than high school). Hi, Liwen! I’m another newbie contributor on the blog! I can relate to how your move affected. you. I moved to a new area when I was ten. It was awful! Although I made new friends, I never forgot my old home since I missed it so much! Welcome! Hey Cecelia! :) Aw, hugs to you. Sounds like we went through similar experiences. Welcome to the blog! I enjoyed your post. I’ve taken a chance on going indie though technically I’m a hybrid. Hi Kimberly! Thanks for your warm welcome. Welcome, Liwen! I loved reading your post. Although ours is a blended family, the oldest child is 20 years older than our youngest. She was definitely afraid of being mistaken as the mom when we went to the mall together. Now the youngest is an aunt and a teen, so it’s come full circle, LOL. Thanks for sharing about yourself. I really enjoyed reading your books and I was really glad to hear more about your here at InspyRomance. (I enjoy connecting with authors of books I like reading.) My favorite series so far is Seasons of Love. I´ve taken a chance of love when I started dating my husband. He had just applied to a masters program in another state and neither of us wanted a long distance relationship.. lucky for us, he didn´t get in (he was accepted at the local school though, so he stayed in town when I finished my last year of college, then got my masters degree too). Fun fact? My husband and I went to the same pediatrician when we were kids. I´m pretty sure we must have met in the waiting room at some point in life. We also played in the same playground many times (probably at the same time), but again, we didn´t know each other until many years later. I love your fun fact! That is so neat. I married my husband after knowing him for six months. Good thing too, because 2 months later, he was sent overseas to Thailand. 6 months later I was able to join him. That was almost 44 years ago. Welcome to Inspy, Liwen! So glad you’re here! Hi Autumn! Thank you! I’m so happy to be here. I had fun and enjoyed reading your blog. You sound like an interesting author. Oh, I totally understand! I don’t like taking chances either, which is why I like to do it in fictional form. ;) It sounds like you’ve had lots of opportunities to do it though! Hello. I’m not sure of taking a chance on something. But I have put some very serious issues in God’s hands and trusting the outcome to Him. Hi there! Trusting God sure does require taking a chance. But it’s reassuring to know He always has our best in mind. Thanks for sharing about you. I can’t really remember something I took a chance on right now..
Hi Laura! No problem. :) Thanks for reading and commenting! Welcome to Inspy Romance, Liwen! So happy to see you here! Welcome Owen, loved the blog post and look forward to reading your books.